BARRY F. LAKRITZ AND THE ENTIRE FIRM has been selected for inclusion in the national publication entitled Best Lawyers in America, for 2019. This is the 9th consecutive year that MR. LAKRITZ has been selected for inclusion in this publication. 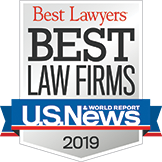 Best Lawyers in America is a peer-reviewed publication that has been described by The American Lawyer as “the most respected referral list of attorneys in practice.” Information regarding those chosen as Best Lawyers in America has appeared in numerous regional and national publications including The Washington Post, The Los Angeles Times, New York Magazine and U.S. News & World Report. 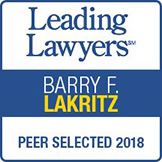 BARRY F. LAKRITZ was recently designated by the National Association of Distinguished Counsel (NADC), as being in the Nation’s top 1% in his specialty. BARRY F. LAKRITZ was recently selected for inclusion in the Million Dollar Advocates Forum, an invitation-only organization consisting of attorneys who have demonstrated their proficiency in relation to litigating cases with a value in excess of one million dollars. BARRY F. LAKRITZ and ANDREW M. SAPERSTEIN were featured Presenters/Speakers at the 2015 No-Fault Automobile Insurance Institute Seminar, sponsored by the Michigan Association of Justice. MR. LAKRITZ has been chosen by the Michigan Association of Justice as a recurring annual speaker since the inception of that Seminar, beginning in 2001 and MR. SAPERSTEIN has been a recurring annual speaker since 2014. BARRY F. LAKRITZ has been chosen as a Michigan Super Lawyer for 2018. MR. LAKRITZ now holds this honorable title for his 12th consecutive year. MR. LAKRITZ'S selection as a Michigan Super Lawyer is a noteworthy career achievement in that it recognizes Mr. LaKritz as being in the top 5% of practicing attorneys in the State of Michigan. Michigan Super Lawyer's Magazine is published by U.S. Law & Politics and has been reproduced in yearly editions of the New York Times Magazine. 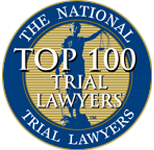 BARRY F. LAKRITZ for 2018, has been selected as a top 100 Trial Lawyer by the National Trial Lawyers Association. He has been chosen for this award for the past 8 years. BARRY F. LAKRITZ has been rated as AV Preeminent for 2018 by the Martindale Hubbell Bar Registry of Preeminent Lawyers. MR. LAKRITZ has held this designation for 29 straight years.The AV Preeminent designation is reserved for those attorneys who have achieved the highest possible peer review rating in both legal ability and ethical standards. BARRY F. LAKRITZ has been selected as a Leading Lawyer for 2018. He has held this designation for the past 3 years. The Leading Lawyers designation is a compilation of the Nation’s top lawyers based upon a survey of their peers. ANDREW M. SAPERSTEIN has been selected as a “rising star” among top Michigan lawyers for 2 consecutive years. This is a peer-recognized listing that is published by Detroit Hour Magazine annually. © 2016 Lakritz Law. All Rights Reserved.